ALL instruments will need some minor drilling for the "set pins" used to stabilize Sperzel tuners. basses with 9/16" holes may need the tuner holes slightly bored out. Or even doweled and re-drilled to smaller diameter (this is a common problem on Fender basses)..
My experience has been that it is rare for the tuner holes to need to be modified to this extent. also: most Basses will accept Bass Sperzels as well. There are thousands of different instrument brands out there, with thousands of different head stock shapes and sizes. So, unfortunately there is no possible way for me to determine if Sperzel tuners will fit on your instrument. So, please carefully use this information (below) to help you decide what type of Sperzels will work best for your instrument. If you are planning on drilling your own guitar tuner holes, then please see the "Drilling your own post holes for guitar" section. *Please note: some Sperzel tuners may vary slightly from these specifications. 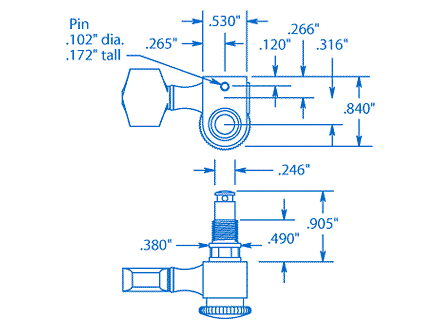 As seen in this diagram; .905" is the post height of a "medium post" Sperzel from a staggered set. .855" is the post height of a "short post" Sperzel from a staggered set. .945" is the post height of a "tall post" Sperzel from a staggered set. I have actually used this template and it worked perfectly! 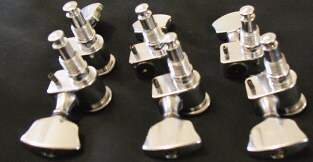 Sperzel Guitar tuners require approx .382" holes in the head stock for the tuners to fit. Please see the "Drilling your own post holes for guitar" section. space on a head stock before the buttons start to touch each other, and are NOT recommended for use on a 6-in-line type setup. not allowing you to run your strings through the tuner posts string holes. So you would not be able to string up your instrument if you exceed the maximum head stock thickness. I don't know of any guitars that have this thick of a head stock.. But I guess there is always a first! then .058" diameter through the tuner post. 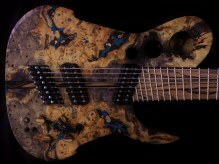 7 string guitar sets are made to accommodate the most common sized low -B- strings. and I can have Sperzel custom drill to a maximum of .070" diameter at no extra charge. 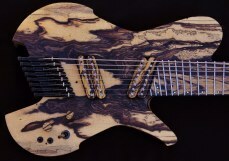 not allowing you to run your high -E- and-B- strings through the tuner posts string holes. So you would not be able to string up your high -E- or -B- string if you exceed the maximum head stock thickness. Here is an example of a Sperzel with it's mounting hardware laid out next to the tuner. Here is an example of a Sperzel with it's mounting hardware attached. Note: This tuner is from a staggered post set; it is one of the keys with the shortest post, as used for B and E strings. before the posts string hole drops below the mounting hardware. Please keep this in mind when ordering your Sperzel tuners. What sized drill bit should I use to drill out my guitar post holes? The Sperzel guitar tuners "post housings" are approx .382" this is only .007" above a precision made brad point 3/8" drill bit. So, I usually find that the best results come from drilling with a high quality 3/8" Brad Point drill bit first. And then slightly boring the holes out by hand to just slightly over .382" using a tapered reamer. Some luthiers will just use a 25/64" high quality brad point drill bit and avoid using the tapered reamer all together. 25/64" = .390" so it's only .008" over the size of a .382" Sperzel guitar post housing. This .008" oversize, really wont cause any problems, and will allow for expansion and contraction of the wood. So perhaps a 25/64" extremely high quality Brad Point drill bit (-IF- you can find one!) may actually be the best choice here. I have heard of some luthiers using 10MM drill bit. However, a 10MM drill bit is at .394"
In my opinion that may be a bit to much oversized (.012" oversized) for a hole that is supposed to be at around .382"
Then again, I tend to be a bit "over precise" about these kinds of things sometimes! Drilling the set pins for Sperzel Guitar tuners. I find that using a 2.7MM drill bit is not as critical as you would think. In fact; the 2.7MM (as recommended on the flap of the Sperzel packaging) is actually larger then the actual set pins. But a 7/64" would be my main choice, just because it is so common. The average size of the set pins are at .100"
A drill bit at 7/64" is equal to .109" so it works out quite well.. However, always making sure to drill exactly where the pin holes need to be, is very critical. Unfortunately the technique for doing this step is rather difficult to explain with out the use of photos and very detailed explanations. Someday (when I have more time) I will try to document this process, and post it on this page. However, if you have any doubts in your abilities to install Sperzels PLEASE be sure to have them installed by a professional Luthier.. If done wrong (it's easier then you would think to screw this up) then it could seriously damage your instrument. There are NO staggered post Bass Sperzels available, they don't exist. If you are drilling your own holes, I usually find that the best results come from drilling with a high quality 7/16" Brad Point drill bit. *!*! *Many popular Bass head stocks (including Fender) have a 9/16" hole. 5 string Bass sets are made to accommodate the larger low -B- strings. Also, keep in mind that most bass strings become tapered at the end. If needed Sperzel can custom drill to .145" max free of charge. Please be aware that all of these measurements may slightly vary from key to key..
Drilling the set pins for Sperzel BASS tuners. First thing you should know, is the instructions that came on the box of your Sperzel Bass tuners are incorrect. They are actually the instructions for the Guitar sets. Hopefully this problem will be changed in the future. 9/64" is just about .005" over the pin size. Always making sure to drill exactly where the pin holes need to be is very critical. Unfortunately the technique for doing this is rather difficult to explain with out the use of many photos along with a very detailed explanation. 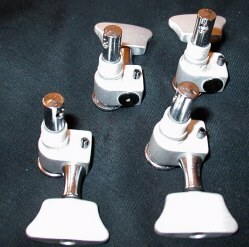 *These specifications were carefully measured directly from newer model Sperzel tuning keys, using a dial caliper. Although these measurements are quite accurate, some Sperzel tuners may slightly vary from these specifications. Sperzel may also choose to change the specifications of tuners as well. -BEFORE- installing Sperzels or any other hardware on your instrument. damage that may result from those who choose to modify musical instrument(s) to fit Sperzel tuners.